Most people think that beauty revolves around all those things that we can see in the mirror. But the fact is that beauty isn’t some superficial pursuit. 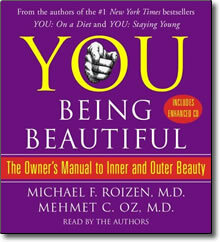 In this groundbreaking work, Dr. Michael Roizen and Dr. Mehmet Oz explain how beauty is really about your health and happiness. Busting the myths about how we view ourselves, they take a scientific, informative, and entertaining look at how the three levels of beauty work together to form a complete, and authentic YOU. Looking Beautiful: Your appearance influences your health and self-esteem; here, the docs will tell you how you can look the way you want. Feeling Beautiful: The docs will tell you how to improve your energy levels, beat back your life-altering aches and pains, and help you come to grips with some of life’s toughest stresses. Being Beautiful: By improving your relationships with your loved ones as well as with others, you’ll be well on your way to finding true happiness. With their usual candor and honesty, Dr. Roizen and Dr. Oz break down the mechanics of beauty and explain how little adjustments in your routine can help you become a happier, healthier person. Navigating the tricky but exciting terrain of today’s beauty industry, they reveal how different foods, vitamins, creams, gels, and injections can really boost your looks. They’ll also take a close look at chronic pain, mood swings, low energy, and financial stresses. And they’ll dive into the science of building relationships, finding happiness, and using spirituality to help you define your own levels of true beauty. Dr. Roizen and Dr. Oz act as tour guides navigating the tricky but exciting terrain of today’s beauty industry. YOU: Being Beautiful is your all-inclusive ticket into the world — the real world — of beauty. Also included in a printable PDF file is the YOU-Q TEST, which will help identify ways to become happier and more satisfied with yourself and your life.